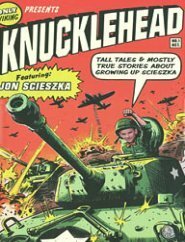 Knucklehead is a great book for reluctant readers, especially if you are doing a unit on biographies. In the book, popular author Jon Scieszka (The Stinky Cheese Man, The Frog Prince Continued...) recounts his early years growing up in a household with six brothers and two caring parents. The series of goodhearted ribbing and pranks and family fun help explain how Jon Scieszka got so funny! Hearing that the book is a memoir about life in a family of six boys, I had assumed it would be full of naughty behavior and frustrated parents. I was delighted to find that is not the case. Instead, this book is truly a homage to family life. While there is certainly a lot of funny adventures and practical jokes and typical brotherly antics, the reader can clearly see how close the brothers were to each other and their parents, and how both of the parents seemed to have the perfect dispositions for handling such a brood. In fact, they seemed to really get a kick out their rambunctious gang. In a starred review of the book, School Library Journal called this autobiography for kids "Entertaining and fast- moving, silly and sweet...not to be missed." Booklist summed it up as "an autobiography about boys, for boys and anyone else interested in baseball, fire, and peeing on stuff." They are probably right about the audience. Pass this one on to boys in your classroom, especially reluctant readers. They are sure to appreciate its charms. This book was an American Library Association Notable Children's Book in 2009. 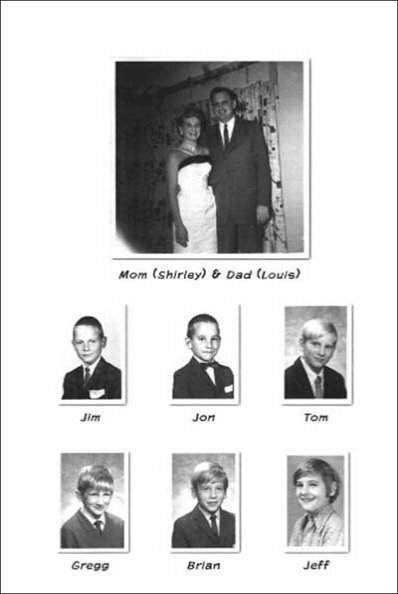 Since this autobiography is about Scieszka's childhood years growing up with five brothers, it's very helpful that he has included pictures of the boys and his parents scattered throughout the entire book. The page at right appears at the front of the book, showing each of the brothers and the parents. Scieszka is the one in the top row, middle. In addition to photographs, Scieszka also includes relevant advertisements and pictures of toys and other objects that he refers to. This also adds to the fun and provides an interesting glimpse in to the era (the 1960s).